As in previous years, the Rotary Club of Cranleigh decided to sponsor two young people to attend the five day course. Hannah Ede and Charlie Bewsey, who were then both students at Glebelands School, were selected to attend, along with 150 other 15 to 18 year-olds, at the Outdoor Activity Centre at High Ashurst, on the slopes of Box Hill. Working in teams of 7 or 8, the students tackled a range of challenging activities such as raft building, rock climbing, making a catapult, kayaking , crossing an obstacle course on ropes, tower building, talking each other round an obstacle course while blind-folded and night time orienteering. Oh - and a 20 km hike across Surrey. However, the students were also able to enjoy some leisure time with a disco and a trip to the theatre to see Charlie and the Chocolate Factory. The climax of the week was a Gala Evening, which was organised by the students, who also provided excellent musical entertainment and hosted the evening themselves. Past Rotary President Michael Hart attended the final Gala Evening and awards ceremony on the Friday night, along with their parents. Hannah and Charlie both agreed that it had been most enjoyable and valuable course, and that it had helped them to develop their personal skills and make lots of new friends. 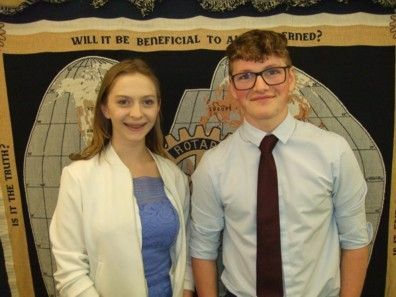 Hannah and Charlie after speaking to Cranleigh Rotary. 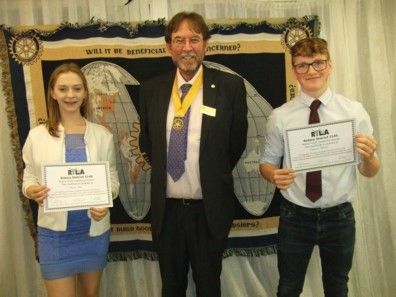 Hannah and Charlie were presented with their RYLA certificates by David Hall, Vice-President of Cranleigh Rotary.